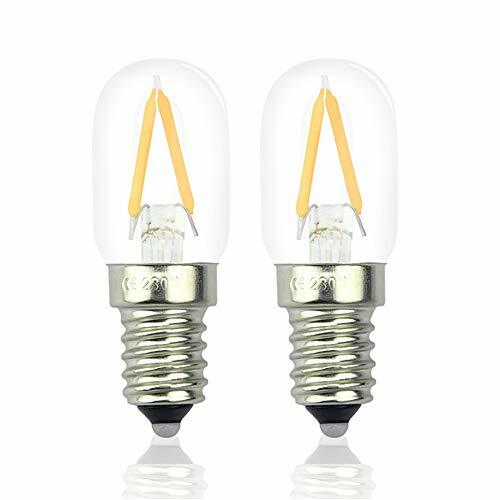 Widely used for refrigerator, cooker hood, microwave, sewing machine, desk lamps, wall lamps, chandeliers, crystal lamps, pygmy night lights, accent lighting etc. 【HIGH BRIGHTNESS】-- E14 led pygmy bulb cool white 6000k, t22 tubular shape, small edison screw ses e14 base, 150 lumens. 【ENERGY-SAVING】-- 2W led is equal to 15 Watts halogen bulbs, can save 90% on electricity bill of lighting. 【SUPERIOR QUALITY】-- Made of glass material, excellent heat dissipationcan. No flicker, no warm-up time. 【WIDELY APPLICATIONS】-- Used for fridge, cooker hood, microwave, sewing machine, desk lamp, chandeliers etc. 【REMINDER】-- This ses led bulb is NOT dimmable. NOT compatible with any kinds of dimming switches/fixtures/systems.